...Many Hispanic families in New Mexico have long known that they had indigenous ancestry, even though some here still call themselves "Spanish" to emphasize their Iberian ties and to differentiate themselves from the state's 23 federally recognized tribes, as well as from Mexican and other Latin American immigrants. But genetic testing is offering a glimpse into a more complex story. The DNA of Hispanic people from New Mexico is often in the range of 30 to 40 percent Native American, according to Miguel A. T�rrez, 42, a research technologist at Los Alamos National Laboratory and one of New Mexico's most prominent genealogists. Simon Romero, "Indian Slavery Once Thrived in New Mexico. Latinos Are Finding Family Ties to It." The New York Times, January 28, 2018. https://www.nytimes.com/2018/01/28/us/indian-slaves-genizaros.html. 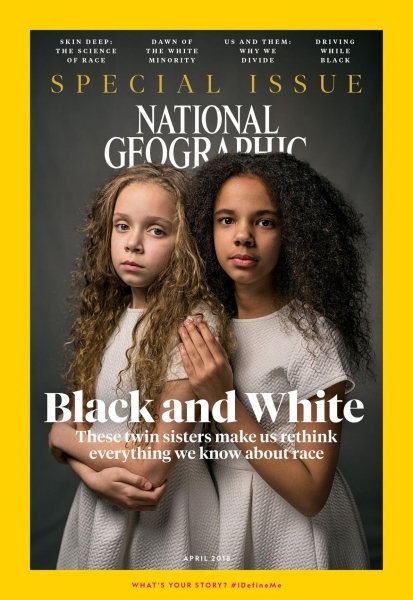 When I first read Patricia Edmonds’ cover story on Millie and Marcia Biggs—half-black, half-white fraternal twins—for National Geographic’s April 2018 Race Issue, I felt conflicted. As a person of mixed race, with a father from Hong Kong and a mother of largely Scottish descent, I was happy for this family’s opportunity to share their experiences. Although national media are increasingly latching onto stories about race, people of mixed race don’t often get the spotlight.